Yet another rehash of whats already been announced and known. I'll believe this when I see it. Story on Adelaide Now, also. ADELAIDE Casino owner SkyCity Entertainment has found a builder for its $330 million expansion on North Terrace, and is due to hand down a major construction contract within weeks. A letter of intent has already been signed with the unnamed builder and a construction contract is imminent with early works due to be completed by the middle of this month before construction work begins before the end of June. The expansion, which covers a new luxury hotel, three new signature restaurants and premium gaming areas, is set to be completed in FY21, when work on an expected car park will also be completed. In February, Adelaide Casino manager Luke Walker told The Advertiser enhanced food and beverage offerings have been the main driver of business and the increase in visitation. The dining hall of the main concourse of the Adelaide Railway Station will also be converted into a sports bar. Also on the cards is a function and events space catering for 750 people and a range of new bars throughout the precinct. Adelaide Casino’s proposed expansion at the rear of the train station. SkyCity expects the expanded property is “likely to take 3-4 years post expansion to reach full potential”. “Expansion should significantly increase revenue and earnings at the property and deliver acceptable return,” it said. The NZ casino operator, which is listed on the Australian sharemarket, revealed the details in its investor presentation shared with shareholders on Tuesday. The group has invested in the Adelaide property in recent years to upgrade ageing infrastructure and opened new restaurants like Sean’s Kitchen and Madame Hanoi, but the presentation also emphasised the need for upgrades to the existing property to “ensure integration between the old and new buildings and maximise overall returns”. Luke Walker, general manager of Adelaide Casino, and Graeme Stephens, chief executive officer of SkyCity Entertainment Group, overlook the site of the expansion. Adelaide Casino contributed $78.1 million in revenues during the first half. On its other properties, SkyCity said it had received “encouraging early interest from broad range of potential buyers” for its Darwin casino business. The group reportedly wants to sell it for at least $200 million, which is seen to be high. Proceeds from the sale will be used to repay short-term debt and fund strategic growth initiatives, including investing more across its NZ properties at Auckland, Hamilton and Queenstown. Total debt is expected to peak at around NZ$1 billion in FY20. SkyCity also revealed it had uncovered an error in the calculation of its International Business turnover over the past three years, which resulted in an “overstated turnover” for FY16, FY17 and the first half of the current financial year. It remains on track to achieve at least NZ$10 billion in turnover for FY18 despite the revised downward adjustment. Shares in SkyCity were trading nearly one per cent lower at $3.75 in early trade. It was always going to be 12 levels ever since it was first proposed? No need for it to be any taller. Announcement today of Hansen Yuncken as the builder. Main works to start next month. Early works are now complete. Great news ... after several years of proposals, announcements, updates, delays and postponements it looks like it's really gonna happen! A $330 million redevelopment of the Adelaide Casino will create up to 800 ongoing jobs upon its completion, SkyCity Adelaide says. Hansen Yuncken was on Monday announced as the builder of the project, which includes new gaming areas, a rooftop bar and a luxury hotel. Work will begin next month. The State Government gave the SkyCity Entertainment Group the go-ahead for the redevelopment last July. Premier Steven Marshall said it would create jobs and grow the state's economy. "Most importantly, it's going to give us better infrastructure and better facilities to attract interstate and overseas visitors to South Australia," Premier Steven Marshall said. "[The new hotel] will equal the best in Australia, if not be above it for this type of facility." Hansen Yuncken was part of a consortium that built the new Royal Adelaide Hospital. It also undertook the first Adelaide Casino development in 1985. State manager Mark Rosenboom said the latest project would involve 1,000 construction professionals over its life, and create 800 permanent jobs on completion. He said Hansen Yuncken would "work predominately with local contractors and suppliers to construct and fit out the 12-level development". 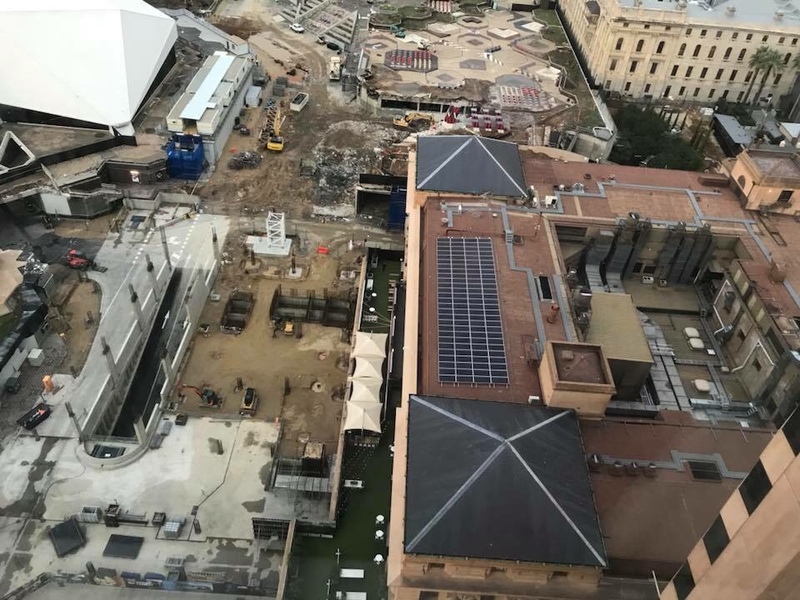 Adelaide Casino general manager Luke Walker said he believed the expansion would create a "significant drawcard" for South Australia. "The South Australian tourism industry has so much to offer interstate and international visitors, and the introduction of this new facility, complete with luxury hotel accommodation, outstanding food and beverage offerings and world-class entertainment spaces will help to attract high-end visitors to the vibrant Riverbank Precinct and to the state," Mr Walker said. The start date for the project comes after a number of delays, with SkyCity Entertainment Group previously indicating the build would begin in mid-2016. Hansen Yuncken and SkyCity Adelaide said construction was scheduled for completion in 2020. As part of the approval process, the Independent Gaming Authority and State Government said they had made it "very clear" the casino would have to "have systems in place to identify and prevent problem gamblers from accessing premium gaming areas". Mr Walker said those concerns were being addressed as part of the redevelopment. "We have world-leading problem gambling services in place," he said. "It's a full-time roster [of professionals], 24/7, to monitor and detect potential problems and we'll be expanding that team. "There's two jobs being recruited currently." Crane started going up today. Sofitel still doubtful. 3 + years since its announcement and still nothing. Given that they applied 5 days ago to demolish the existing building and start construction of the Sofitel, I would say there’s probably not much doubt left.